A bit of boutique style at a much more real-world price. Beautiful use of alternative woods. Expensive for an Asian-made guitar. Designed by Patrick James Eggle and made in Faith's Indonesian factory, these signature models are all about more unusual back and sides woods such as London plane, ancient bog oak, or British sycamore, as here, in a beautiful 'bronzed' stain that's not over-coloured. Essentially a botanical twin of maple, the solid back and sides do look quite maple-like, and spectacular with it. 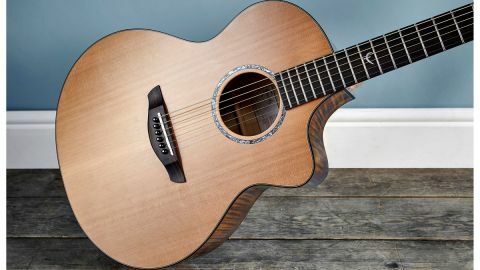 On one hand, £1.5k seems expensive for an Asian-made guitar, but this quality level could be seen on a USA-made guitar that would cost you considerably more, especially with its tight-grained cedar top and clearly thin high-gloss finish. The Neptune's body is very similar to Taylor's 406mm (16-inch) wide GA, so it's on the bigger side of the tracks, and with its 650mm (25.6-inch) scale length, 45mm nut width, with 37mm string spread, and bridge spacing of just a shade under 56mm, it feels very spacious. The slick playability is helped by more electric-like wide/flat frets neatly installed on the black bound Macassan figured ebony fingerboard with its 406mm camber. The same wood is used for the bridge, which features Indian ebony bridge pins with abalone dots, while the soundhole rosette is a 5mm wide ring of green abalone with a fibre border. Bolted to the body, the mahogany neck, with spliced headstock and heel, has an almost classical feel to it, a subtly flat- backed D. It's all impressively tidy from the clean interior with side supports to the solid rosewood edge binding, back stripe, heel cap and headstock facing. Then there's the Bali bone nut and compensated saddle, not to mention the classy nickel-plated Grover tuners with their ebony buttons. While it might be on the larger size for ultra-comfortable seated playing or recording, it's far from unmanageable. Its quality sounds will no doubt mature as playing and age take effect. Maple - or indeed sycamore - isn't exactly flavour of the month, but combined with the spruce X-braced cedar top here, there's a sizeable low end and balanced mids. There's also noticeable compression strummed hard, the cedar top seemingly less explosive than spruce; for recording, that could well be a bonus. Fingerpicked, there's a delicate, chiming timbre. The tropical woods used throughout the history of steel-string acoustics are either diminishing or becoming prohibitively expensive. It's welcome, then, that Faith (among others) is presenting alternative woods. Pairing British sycamore with cedar is not only a beautiful aesthetic choice but one that imparts an equally beautiful, quite modern tonality that could see plenty of use either solo or in an ensemble recording or performance. It has the brightness and balance of a maple guitar, but that cedar top seems to tame it a little and create something special.